I am so excited to come back to my normal posting schedule and I have to apologize in advance for the absence. I was terribly sick and it took a big toll on me and my workload has been bigger than ever. I couldn't wait to share this post with you guys because it's actually different than most of my wardrobe. Although I own a few hundred white button-up shirts, I love a colored ensemble. I chose to opt in for a muted and neutral ensemble and have my bag be the statement piece. 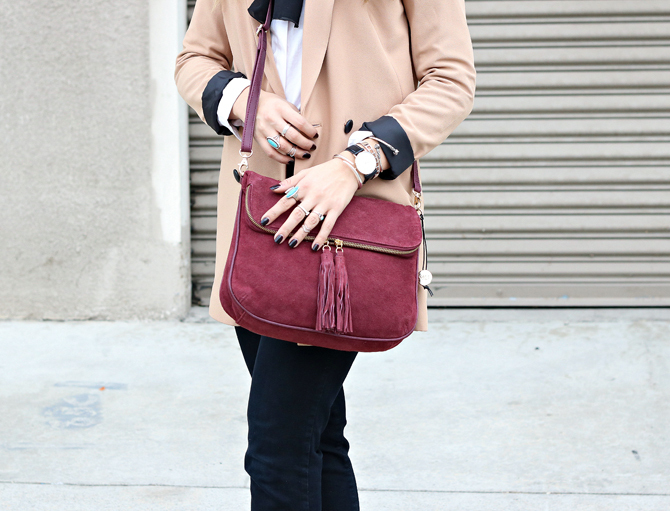 I paired my double breasted camel blazer with black and white pieces and threw on a burgundy suede cross body bag to add texture and some color. Looking absolutely breathtaking in this outfit! The way you've styled it, is simply magnificent!